The Olympus FE-47 Digital Camera is a 14 megapixel compact camera that produces advanced picture quality and allows you to create larger prints in detail. The Olympus FE-47 is a lightweight compact entry-level camera that beginners will enjoy. 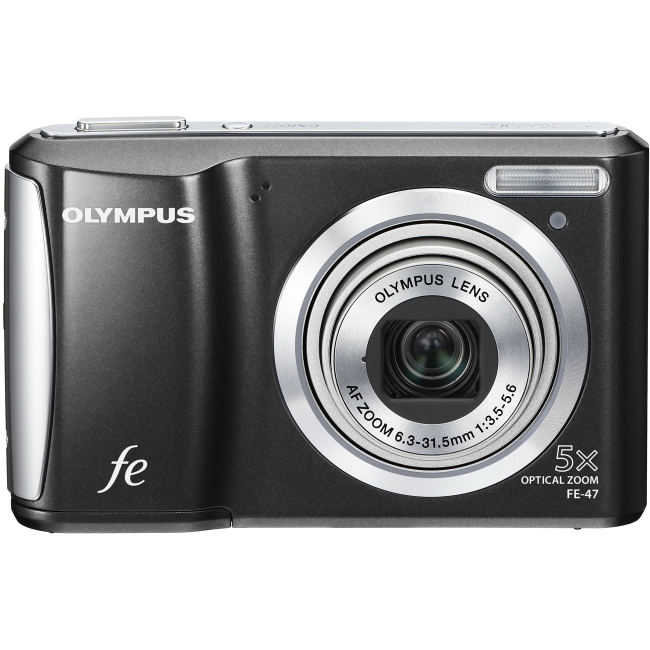 The Olympus FE-47 Digital Camera weighs approximately 6.1 ounces with dimensions of 3.9” x 1.1” x 2.4” making it possible for you to carry it anywhere you want. The FE-47 contains a 1/2.3-inch 14 megapixel CCD image sensor and with the 5x optical zoom lens that has focal lengths equivalent of 36 mm wide angle to 180 mm telephoto coverage. The lens has an aperture value of F/3.5 to 5.6 with an automatic focus adjustment at a distance from 23.6 in. For a much closer look the FE-47 employs a macro lens with a focus range of 3 cm. The Olympus FE-47 has an AF tracking which tracks unpredictable, moving subjects and adjusts the focus and brightness accordingly for crisp shots. The camera is also equipped with a Digital Image Stabilization feature which uses higher ISO and faster shutter speeds to reduce blurring and capture sharp photographs. ISO sensitivity for the camera ranges from ISO 64 to a maximum of ISO 1600. The Intelligent Auto feature of the FE-47 allows the camera to identify the scene using the existing conditions such as Portrait, Landscape, Night Portrait, Macro, or Sport and adjusts accordingly to improve image quality. The FE-47 also employs a face detection function that assists the Shadow Adjustment function. What it does is it allows you to capture faces with the right brightness between the background and the subject. The Olympus FE-47 Digital Camera has 13 scene modes for easy control over settings of the photos. The camera is capable of recording movies at 640 x 480 or 320 x 240 pixels at 30 or 15 frames per second in AVI format. Images are recorded in JPEGformat with resolution of up to 4288 x 3216. The Olympus FE-47 is equipped with a built-in flash with an effective range of 12 ft and a red-eye reduction feature. 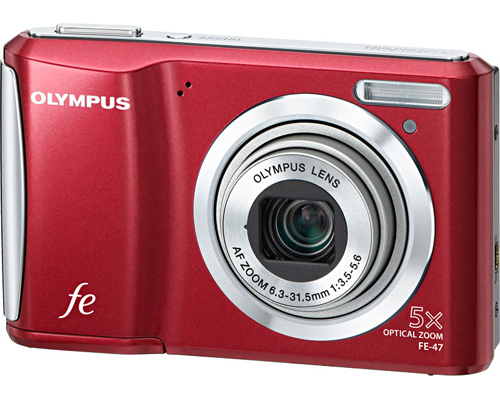 The Olympus FE-47 Digital Camera has no optical viewfinder but the built-in 2.7-inch LCD display is enough for framing and reviewing tasks. The TFT active matrix color LCD display is rated at 230,000 dots. The camera uses two AA-size alkaline batteries as its power source. Battery life is approximately 120 shots on a full charge. SD and SDHC memory cards are compatible with the FE-47. The Olympus FE-47 Digital Camera has no real mechanical or optical image stabilization, using Digital Image Stabilization may cause the quality of the images to be compromised. Image stabilization is particularly poor and sometimes the available settings of the camera couldn’t catch up with the preferred settings for the given situation. The time that the camera focuses on the subject takes quite a long time. Couple it with shutter delay and lag, making your turnaround time per shot to extend and slowing down your shooting time. Review it: "Olympus FE-47 "
Accessories for the Olympus FE-47 include different camera cases of various designs, USB cables for to download images from your camera to your computer, an A/V cable can be used to connect the camera to the TV, and wrist straps for easy carriage. A Ni-MH Charger and battery can be used as an alternative to alkaline batteries. The camera only supports SD memory cards used to save images and movies. Finally, drivers and utilities come in a CD-ROM.